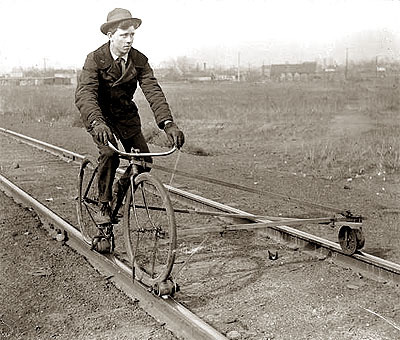 circa 1905 Necessity was always the mother of invention, especially when it came to bicycles and the vast distances -- and the lack of roads -- in the West. Two boys on a bike trip are sure to find adventure. Send them off into the wilds of the American West, and it's a safe bet adventure will find them. In 1909, Vic McDaniel and Ray Francisco, just out of high school, set out from Santa Rosa, California, on second-hand bikes, bound for the great Alaska-Yukon-Pacific Exposition in Seattle. Traveling on dusty roads, roads of logs, of planks, even of corn stalks, and often no roads at all, they pedaled, pushed, and walked a thousand miles north for fifty-four days. With excitement in their hearts and a good luck billiken in their bedroll, they started out with only $5.65 between them. Camp was wherever, whenever the sun was gone; food was an occasional meal from a kindly farm wife and what they could fish, hunt, or glean. But they learned that all strangers were not kind, not even close. Vic and Ray reported their adventures to their home-town newspaper. And what adventures they had. They met their share of memorable characters, from a young girl who stole Ray's heart to a pin-striped hustler who tried to pick Vic's pocket. They traveled paths beside railroad tracks, fought their way around boulders and up brushy hillsides, and crossed rivers layered with salmon. They survived a grizzly's nocturnal visit and the sudden terror of a snake bite. They held their breaths crossing railroad trestles over treacherous canyons, and discovered that a railroad tunnel doesn't offer safe passage when you're halfway through and a train comes along. Evelyn Gibb, daughter of one of the cyclists, has drawn on her father's recollections to tell this incredible adventure in his voice. 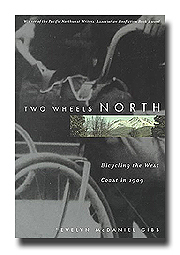 Winner of the Pacific Northwest Writers Association Nonfiction Book Award, Two Wheels North is a captivating account of a journey that today we can only dream about -- one that finds two boys on the road not only to Seattle, but also to manhood. Evelyn McDaniel Gibb is an award-winning writer whose stories and articles have appeared in dozens of magazines and in the popular Chicken Soup for the Soul series of books. She lives in Sedro Woolley, Washington, in the foothills of the North Cascades. 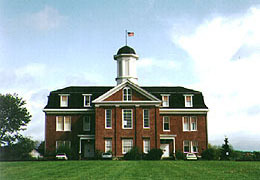 October 2000. 6 x 9 inches. 192 pages. Illus.